The famed "tiger beach" on Grand Bahama has long been known for aggregations of its namesake shark, but the another island in the Bahamas archipelago, South Bimini, has been vying for some attention this week. Researchers there recently tagged and released a 13-foot (3.96m) record-breaker. And this isn't the first noteworthy appearance of late. "Not even two weeks ago we acoustically tagged a record male tiger shark (3.72m) ... two record sharks within this month!" the team wrote on Facebook. Even for an experienced crew, handling such a large animal can be challenging. Tiger sharks are less sensitive to stress than some of their kin (like hammerheads), but conducting each workup quickly and carefully is of upmost importance. 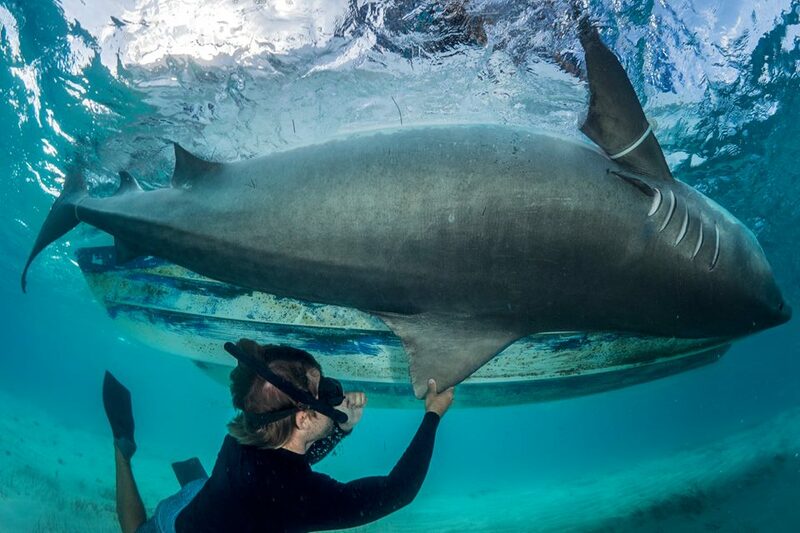 "This female tiger shark was so large that we struggled measuring her on the boat," the researchers said. "Luckily [principal investigator] Matt Smukall came to the rescue, and measured the girth of the shark underwater, as you can see pictured." The animal was fitted with a small acoustic tag, which will broadcast her whereabouts for years to come each time she cruises past one of the many receivers in the region. We know that these cosmopolitan sharks inhabit tropical and sub-tropical waters worldwide, but researchers still want to learn more about the places these top predators regularly visit. Tags like this one can help us better understand how tiger sharks use critical habitat – and more importantly, where that critical habitat is. Some have speculated that the shark's large girth (close on six feet) indicates pregnancy, but Smukall and his team note that it's tough to say with certainty. "It is very difficult to determine pregnancy without an ultrasound," he says. "For her size, she had an average girth measurement. So if she was pregnant she was most likely not very far along in term." Recent studies do suggest that at least parts of the Bahamas act as a nursery for tiger sharks, so the possibility remains. "Our data suggests that Tiger Beach may function as a refuge habitat for females to reach maturity as well as a gestation ground where pregnant females benefit from calm, warm waters year-round that help incubate the developing embryos and speed up gestation," University of Miami shark biologist Dr Neil Hammerschlag told us last year. As you can see, tiger sharks produce large litters – but the pups are inefficient swimmers, and extremely vulnerable in the early stages of life. Learning where these threatened animals go to breed is a crucial step in better protecting future generations. "The entire Sharklab was ecstatic to catch such a large shark," says Smukall. "The Bahamas is far ahead of most other countries and has protected sharks within its waters. 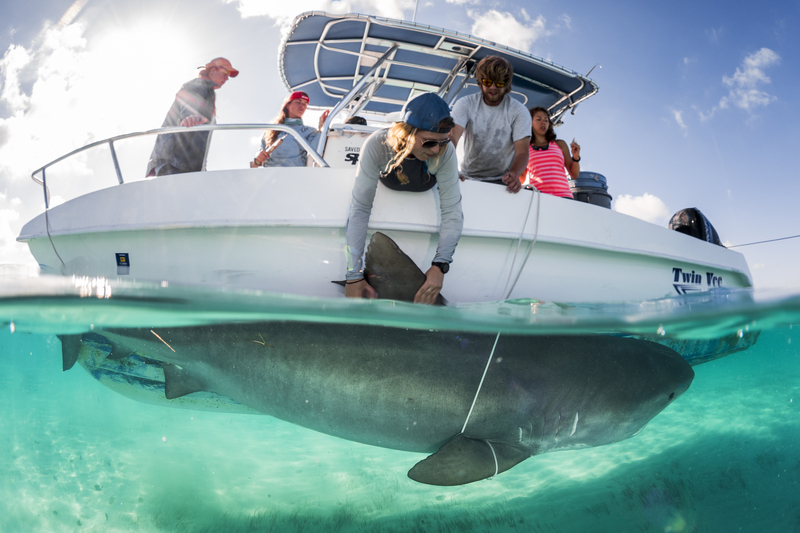 One major concern is that large sharks like this will frequently travel outside of the protected waters of the Bahamas and are [then] susceptible to fisheries." Pregnant or not, the presence of this shark is a welcome one. Like other top predators, these animals play a key part in a balanced ecosystem. Spotting such a healthy female is good news, and we're happy to report she was released without any trouble. Was this Bimini behemoth headed for the gestation grounds off Tiger Beach? Are tiger sharks using the waters around Bimini in similar ways? With any luck, we'll soon find out. Our planet is a busy, crazy place. And amidst all the noise, voices get lost and some stories are never heard. That’s especially true of our planet’s countless wild species: big and small, threatened and persecuted, complex and fascinating. For our growing team of writers and contributors, those are the stories that matter most: we dedicate our time to them all day and every day. In a world bursting with news, nature is our niche – and we love it that way. You, our viewers, are passionate about these stories we tell. Take your passion further by supporting and driving more of the nature news you know and love. A team of researchers from the Long Island Shark Collaboration recently tagged the first ever great white shark pup in the Atlantic Ocean. Get the latest nature news, views and videos delivered to your inbox.